A spoof on the three little pigs story, this time told from the wolf's point of view. Lane Smith also illustrated Hallowe'en ABC which was one of The New York Times Best Illustrated Books of the Year. http://MarissaKendrick.booklikes.com MarissaKendrick 5.0 The True Story Of The 3 Little Pigs! text The True Story Of The 3 Little Pigs! 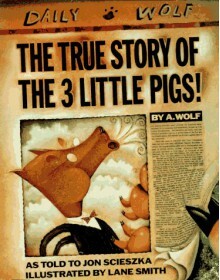 http://Toriannwolfe.booklikes.com Ms.Wolfe's Classroom Books and Finds 5.0 The TRUE Story of the 3 Little Pigs!